* Please carry a valid original photo ID to enter. * The American Center is a 2 minutes walk from the Barakhamba Road Metro Station. * Seats are limited and available on a first come, first served basis. * All visitors may be featured in photos or video to be used for promotional purposes or on social media by the American Center or U.S. Embassy India. * The American Center does not provide public parking on its premises. 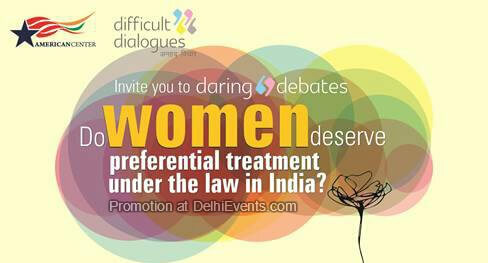 Event Description : As a part of the 16 Days of Activism Against Gender-Based Violence, the American Center and Difficult Dialogues (DD) invite you to the third edition of daring debates on “Do women deserve preferential treatment under the law in India?”.